Taken as part of the EMC Bi-centennial celebration in 2012. Mennville Evangelical Mennonite Church, located near Riverton, Manitoba, was the first Evangelical Mennonite Conference congregation established in Manitoba’s Interlake Region. In the early 1950s EMC families moved to the Washow Bay district for various reasons, including seeking freedom for their religious practice, land for farming, and to reach out spiritually to the wider area. They began a Sunday School and built a school (that was also used for worship). EMC deacon Jacob D. Friesen from Morris and minister Peter P. Friesen from Blumenort moved to the area with their families in 1952. In 1954 David P. Thiessen and his wife Katherine became leading pastoral couple. They served till 1973. Leonard Dueck and Milton Friesen were elected as additional deacons in 1967 and 1974, respectively. Additional ministers were elected -- Harry Friesen in 1968 and Terry (and Eloa) Dueck and Roger Plett in 1985. The congregation had a period of paid leadership and also a time of local unpaid ministers who provided leadership. The language of worship was German in the beginning and transitioned to English in the 1970s. The church grew rapidly and by 1960 had 113 members. Church growth peaked at about 170 in the 1970s. In 1989 it had about 135 members. In 2016 its membership was 154. When the Washow Bay post office closed in 1966, the area became known as Mennville, and the church name Mennville EMC. For many years the church operated the Mennville Christian School, which offered instruction from Kindergarten to Grade 10. The school closed in 2009. EMC Yearbooks. Steinbach, MB: Evangelical Mennnonite Conference, 1958-2016. Hamm, Menno. “Church Profile: Mennville Evangelical Mennonite Church.” The Messenger (24 March 1989): 7-10. [Hamm, Menno.] “Mennville Christian School.” The Messenger (24 March 1989): 11. Smith, Terry. 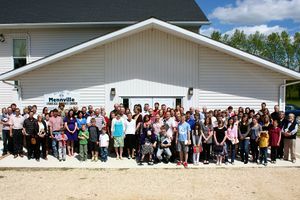 "Mennville Evangelical Mennonite Church (Riverton, Manitoba, Canada)." Global Anabaptist Mennonite Encyclopedia Online. June 2017. Web. 23 Apr 2019. http://gameo.org/index.php?title=Mennville_Evangelical_Mennonite_Church_(Riverton,_Manitoba,_Canada)&oldid=148992. Smith, Terry. (June 2017). Mennville Evangelical Mennonite Church (Riverton, Manitoba, Canada). Global Anabaptist Mennonite Encyclopedia Online. Retrieved 23 April 2019, from http://gameo.org/index.php?title=Mennville_Evangelical_Mennonite_Church_(Riverton,_Manitoba,_Canada)&oldid=148992.